The last time you brought your car in for an oil change, the technician may have mentioned something about your cabin air filter. Maybe you have no idea what they’re talking about, Maybe you see it as one more thing to increase your maintenance bill. The reality is that your cabin air filter does play an important role in a vehicle’s HVAC system. Read on to learn the importance of the cabin air filter and why you should change it regularly. Usually found either under the hood or beneath the dashboard, the cabin air filter is a standard feature of most vehicles manufactured in the 2000s and beyond. Its purpose is to filter any contaminants like dust, dirt, or pollen, as well as other debris such as insects and leave out of the air entering the car’s climate control system. Does it really need to be replaced? You can think of the cabin air filter as a bit like your home’s furnace filter. Eventually, it does become clogged, which does affect the vehicle’s air flow. 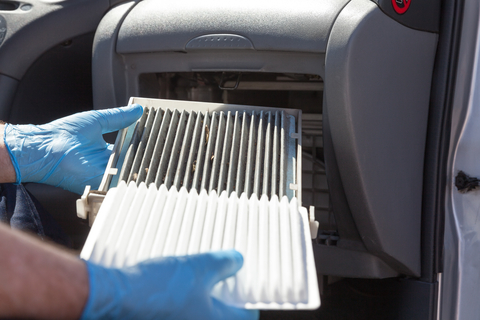 There are two major things you might notice if your cabin air filter needs to be changed. First of all, you may notice reduced air flow. Even if you have the air flow up to max, you may notice that it’s lacking some power. You may also notice that the air conditioning isn’t as cold as it used to be. Both of these issues can be results of a clogged cabin air filter. Secondly, you may notice odd smells coming from the vents, or poorer air quality in your vehicle. If you have seasonal allergies, you may also notice that you’re sneezing more than usual in the car, especially when blasting the A/C on a hot day. Mould spores, decaying leaves, sludge, or any number of other trapped substances could be causing the smell, none of which are great for you to be inhaling. More noticeably, this makes for a less comfortable ride for both you and your passengers. Depending on who you ask, you’ll get a different answer each time. Some recommend every 25,000 km, while others say as high as every 50,000km. We recommend starting with your vehicle’s owner’s manual to see what the manufacturer recommends and use that as a starting point. If you notice any other the symptoms above, it’s probably time to replace your cabin air filter. Questions? Feel free to contact the team at Park Muffler today!